Candidates and organizations spent $300,240 on last November’s race for three seats on the Laguna Beach City Council, making 2014 the most expensive campaign in a dozen years. That cumulative figure is based on financial disclosure filings by the candidates and committees for the entire previous year and released by the city clerk last week. Based on the 20,361 individual votes cast, candidates spent $14.75 for each. In the past six elections, campaign spending has averaged $204,000 a cycle, according to an informal compilation of campaign spending by the Indy. Embattled candidate Jon Madison deflected questions about his claims about academic and professional accomplishments and eventually lost his bid for City Council. collecting contributions whose campaign momentum decelerated when his academic claims and diploma proved fabricated. He still received 1,770 votes, or 8.7 percent of the total, according to the OC Registrar’s final results of the Nov. 4 election. First time candidate Robert Zur Schmiede raised the second-largest kitty at $60,129 and spent all but $2,000, according to the filing by his campaign treasurer, Matt Lawson. He received 22.5 percent of the vote and filled a spot vacated by former Mayor Elizabeth Pearson. 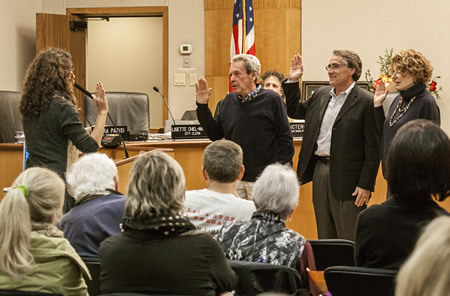 Newly elected City Council member Robert Zur Schmiede, center, flanked by incumbents Kelly Boyd and Toni Iseman, all take the oath of office. Incumbent and top vote getter Kelly Boyd, who received 4,675 votes or 23 percent of the total, received $39,286 in contributions and closed out his campaign with an $8,431 surplus, treasurer Cheryl Kinsman reported. Longtime incumbent Toni Iseman received just 20 fewer votes than Boyd, but outran him in the race for contributions and spending. She raised $49,979 and spent all but $60, campaign treasurer Mary Ives reported. Michele Hall, also a first time candidate but unsuccessful in her bid for office, reported collecting $29,331 in contributions and a balance of $156, campaign treasurer Lysa Ray reported in a Feb. 2 filing. Hall largely underwrote her own campaign, making a total of $15,000 in loans to her own cause, the filing shows. Hall received 2,912 votes or 14.4 percent of the total. Paul Merritt raised $12,650 in contributions, also most of it in a loan from himself, and had $861 remaining as of Dec. 31, the unsuccessful candidate reported. He received 1,200 votes. Candidate Eli Grossman reported no expenses and collected 539 votes or 2.8 percent of the total. In the final weeks prior to the general election, the biggest expense made by city council candidates Madison, Boyd, Iseman and Zur Schmiede all went towards print brochures delivered directly to voters by mail. Of the independent committees involved in the campaign, only Village Laguna revised its previous filings and disclosed $14,600 in contributions in the final period and spending $26,934 overall, treasurer Richard Picheny reported. 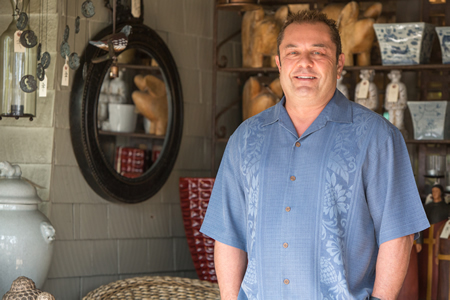 Village Laguna raises the bulk of its treasury from its annual Charm House tour of historic homes. The organization backed candidates Iseman and Zur Schmiede in the November election and by far outspends other independent committees. Laguna Beach Taxpayers and police and fire employees associations earlier disclosed campaign expenses of $5,350, $2,374 and $11,000 respectively. I am curious about how much Rob, who wouldn’t know what integrity is if it meant his life, contributed to the Republican HUCKSTER Sheet he was on. How does a Democrat(??) have Integrity if he pays for a Republican whore sheet?